I’m not a car guy. 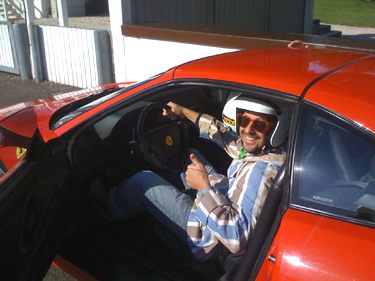 But when presented with the opportunity to race a Ferrari out in the English countryside, I couldn’t resist. Who could? After signing in, we checked out the safety equipment. As you could see, they were ready for any size and shaped skull. I was especially heartened to see that they had an ambulance on hand. Too bad, there were no EMTs on site. 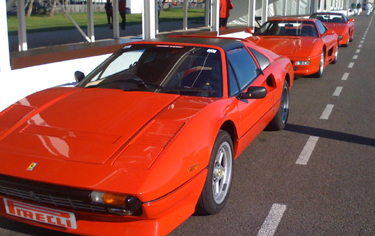 Now here’s a quandary I never thought I’d be presented with: the next step was to pick out a Ferrari, but which one? I settled on the F-355 (not that the number meant anything to me). I chose it because it has paddle shifters on either side of the steering wheel, which makes driving it like playing a video game: you don’t use a clutch or take your foot off the gas to shift – you just do it. As someone who learned to drive in a 1980 Honda Civic with an incredibly unforgiving clutch, I would never have imagined such a thing. After I selected my auto, I was properly outfitted. As you can see, I wasn’t alone in the car. 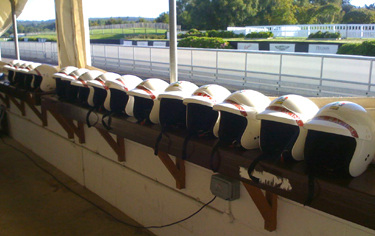 An instructor was so impressed by my skills that he asked to come along for a lap or two – you know, to show him how it’s done. You may be wondering if by the end of the day I become a “car guy.” Not really, but as with all the bourgeois activities that sometimes come my way, in order to have a good time, I left my cynicism in the dust, this time literally…Vrooooom!! In case there are any car people out there who are curious, the least interesting of the cars was actually the far superior. 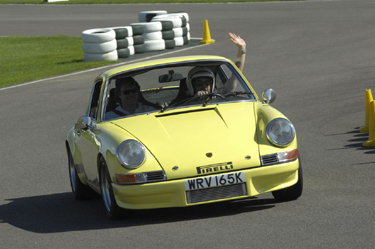 The Porsche won, hands down. 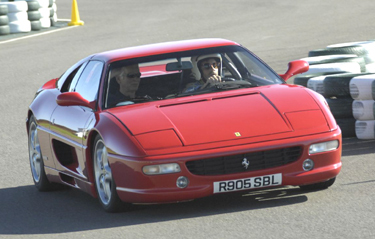 It accelerated on the straight-aways better than the Cobra, and it handled the turns better than the Ferrari. 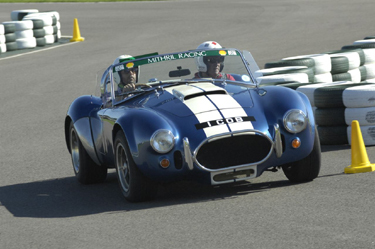 The Cobra definitely gets my vote for coolest looking car with the Aston Martin coming in 2nd. Did they give you any idea how often folks plow a car into the barriers? 2: The instructor told me that he knew of only two people who skidded off the track. I didn’t believe him either. 3: The track was circuit-style meaning that it wasn’t a giant oval, but had lots and lots of turns, so there was only one real straightaway. I got the Porsche up to about 120 before having to slow into the first turn. 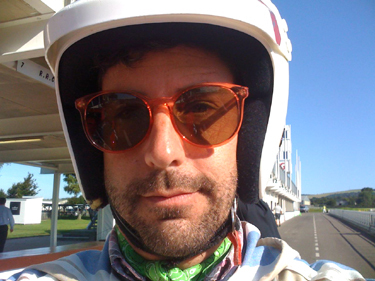 These things said, I was far from the gutsiest driver out there — when I was driving the Ferrari, I was passed by a Cooper Mini. That was a little embarrassing. OMG! 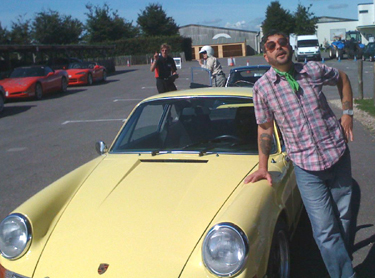 That sounds like a dream date – me and a really fast car. I’m impressed that you were able to race in a right-side drive car! And that ascot – gorgeous, dahling. Oopsie – the above comment was most definitely not by Tim – it was by his lovely and fast-driving wife. Scott, this looks super cool; definitely the second coolest thing you’ve done lately. We’ve had shout-outs for the helmet and the ascot, but can I throw some love out for the sunglasses? Excellent. A very fine look. Where in the British countryside? 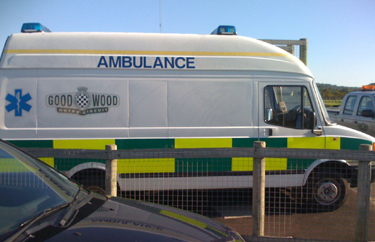 Oh, I just saw Goodwood on the side of the ambulance. So…how come they had left-hand drives? And when will we see this fashion shoot on the pages of GQ? YEAHHHHHHHHH!!!!!! Phillies!!!!!!! Bedlam in Philly!!! Youtube link to follow. YES!!!!! umm . . . that’s not really an ascot. it looks more like a “kerchief” simply tied around the neck, nice to be sure. but since you’re on that road, so to speak, why don’t you try the real thing. a nice silk one, perhaps with a leopard print? for bunch, in maria del rey! Lane, you don’t get to tell Scotty how to dress. i’m simply making sure everyone at TGW knows a true ascot when they see one. 14 – 17: I’m fully aware of the categorization of my accessories. I just choose not to correct people when they compliment me. It is in fact a simple kerchief that I am wearing in the photos. I do have a silk ascot, but prefer the French-farmer style of wearing a cravat. Between your comments here today and that email you sent me and farrell congratulating our team for winning “that little championship” as you put it, I am just not sure what to make of you today. Actually, I am, but it’s not very Christian.
. . . what . . .??? . . .
you’re not a christian for one, and . . . hmm, really, i’m just making sure everyone knows the difference between a kerchief and an ascot. really, for the PROMOTION of ascots in general. it’s something I would like to see more of. Baitken would look splendid in one. Ruben, naturally, perfect with his name. Farrell would be smashing as would Cedar. Waterman, not so much and I don’t think I could do it. I’m too tall. Jeremy perhaps, Dave maybe, but Etan – YES! I’d like to see more of them, but not kerchief imitations. The real deal, silk, PATTERNED from the best shops on Carnegie Hill! ok and now i read scotts reply. anything based on the style of french farmers is A-OK with me! Actually, Trixie, with the right outfit you could probably pull off an ascot as well. Gee I din’ mean to cause all this tiffing. 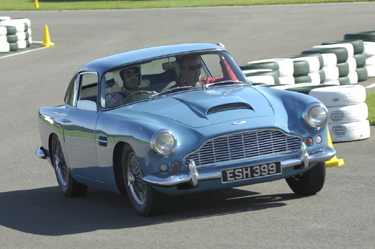 I knew it was a kerchief (though I would have said “bandanna”) — just seemed like an ascot would be the proper thing to wear around one’s neck when driving a Aston Martin, plus the pun referenced in 18. As for me I prefer to go with the Wisconsin-farmer style of wearing OshKosh and flannel. Just to confirm, when we lived in SF Mr Godfree was so famous for that particular look that most of our friends called him Ascott. thanks, adrianna! i think i will work on rocking the ascot.